#Microsoft365 #Office365 – Very often I get asked the one BIG thing that affects User Adoption negatively when moving to the cloud. Of course there are many technical challenges, and I’m very grateful for the people out there dealing with those and making the magic happen. I’m fortunate to be dealing with the easy / fun stuff – the people. And this brings me to our biggest challenge, or shall we rather call it an opportunity for improvement. User Adoption is not a new challenge when it comes to moving to the cloud. It’s a problem we’ve had for a very long time. In my opinion the biggest influence is PC Literacy, or Digital Literacy as it is now known. Digital literacy is the ability to effectively and critically navigate, evaluate and create information using a range of digital technologies. Navigate of course is to find something. Effectively on the other hand means to accomplish something without waste. So at the heart of Digital Literacy is the ability to find ‘stuff’ without wasting time. If I was only giving the opportunity to train end users one skill, it would be to search better. That’s it, nothing else. Perfect example of this would be people putting files on their desktops. “I save it there so I can find it Tracy”, I hear this way too often. That also goes for shortcuts to programs, sticky notes on your desktop and mailing yourself a mail again so you can see it first in your Inbox tomorrow morning instead of flagging the mail or creating a task that you can manage. The natural progression from shortcuts to every program on your desktop was to click on the Start button, go to programs (control panel), then select the program (setting) you want to open. Or going to File Explorer and double-clicking your way into the deep, dark maize you call your File Share folders. I’m also thinking of the countless folders I see in users’ mail Inboxes – used to create calm in their chaos, or they just wouldn’t find that mail sent from Bob about the ABC Project in April of 2016. The World Wide Web (WWW) taught us to search. Thank goodness, as there is simply no way to navigate to a site that you do not know the name of, or find a product if you do not know who supplies / manufactures it. Sadly it seems this skill stayed confined to the web browser and search engine. Some of us evolved in starting to search on our desktops. Instead of navigating to programs, files and settings, we started using the Windows button to search and find it faster. CTRL+A then CTRL+F let’s us search documents / pages faster, searching in the Outlook Inbox gets to results faster than clicking through folders. 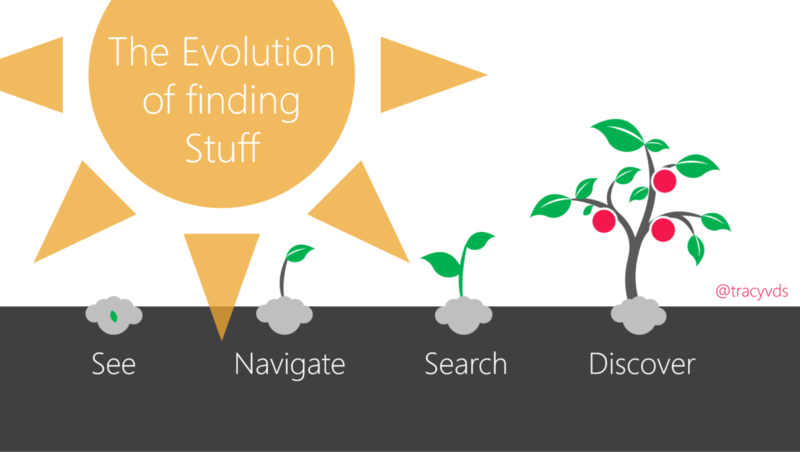 In SharePoint we search from the landing page, using boolean operators to get better results – instead of navigating to the sites / libraries we suspect contains the content we’re looking for. How do I discover content daily? FaceBook suggests articles I might want to read, Google changes my search results based on previous searches, YouTube shows videos I might want to watch, Pinterest compiles content in boards for me to enjoy and in Microsoft Office I use the Recent Files and Shared with Me to find files faster, Delve / Office Graph is giving me results based on content and people I work with etc. I train people every day to use the Windows Button to search their pc’s. Yup. This brings me back to those statistics that says about 75% of your users aren’t PC Literate. Most of our users are stuck in “See” and “Navigate” mode. Simply because they don’t know better. I recently wrote a blog How we deliver IT Support should change. I spoke about how we’re actually causing a problem that annoys us most. We’re not helping our users by just fixing their problems. We should be helping them, help themselves. Don’t ever forget that everything you know, you were taught by someone. Yes, even when you google something and find a solution – someone wrote that article or made that video. Having an attitude of “users should figure things out” is not going to get us anywhere. If we invest in our users and help them be more PC Literate, they will have more confidence which leads to “self learning”. This is what we want. So what I’m saying, is that you cannot teach a user to adopt a new digital workplace if they’re not using the ‘old environment’ efficiently. It’s not their fault, seeing as our idea of Induction is shoving a new laptop in their hands and pointing them to the Outlook and SharePoint icon on the desktop. Please, I beg you: Help them become confident self-learners, show them how awesome technology really is and you will be rewarded with users who want to adopt new technology and be more efficient in the process.